AtomType is a base class, inherited by IntType, FloatType, StrType, and PredType. 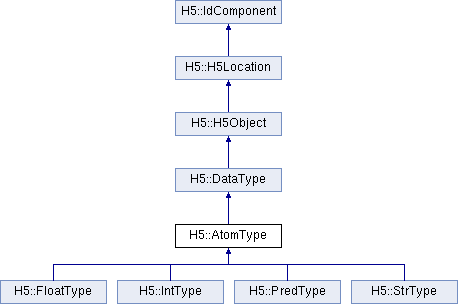 Reimplemented in H5::FloatType, H5::StrType, H5::IntType, and H5::PredType. H5T_PAD_ZERO (0) - Set background to zeros. H5T_PAD_ONE (1) - Set background to ones. H5T_PAD_BACKGROUND (2) - Leave background alone. The precision is the number of significant bits which, unless padding is present, is 8 times larger than the value returned by DataType::getSize().